We offer three levels of soul-nurturing support to help you live according to your soul’s deepest truth and optimize natural cycles of change. Already a Member? Click MEMBER LOGIN on the menu above. Manifesting with Moon Cycles is my exclusive monthly program for healers and visionaries who are ready to experience the profound healing and soul support astrology can open us to. Working with natural cycles helps is the ancient and yet revolutionary approach in which you are never alone. The universe has your back and wants you to succeed. 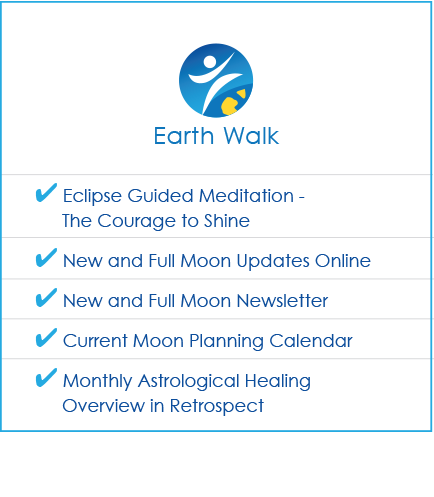 Earth Walk members receive updates, calendars, and retrospective healing forecasts that are updated monthly, and a special free gift meditation. And if you like what you see (and hear), you will LOVE our upgrade options. In addition to everything included above, if you choose to upgrade, you will receive even deeper support for living your deepest, most empowered, soul-resonant truth. You will have a structure and guidance for working with the energies of natural cycles that will help you unlock your creativity, leadership skills, and role as an agent of healing and change… all with an understanding of how the universe supports you with continual opportunities for loving transformation. A special FREE GIFT–my most popular guided meditation from 2017! Eclipse Guided Meditation – The Courage to Shine will help you step into your calling as an agent of healing and compassion in the universe. Full details about what is included are provided below! Join now at the free level, or read on to learn about our upgrade options. A brand new GUIDED MEDITATION for each New and Full Moon that immediately shifts your perspective so you are LIVING your highest potential. A written MONTHLY OVERVIEW with easy and practical HEALING EXERCISES that bring positive change into your daily life. Includes personalized support based on the Lunar Nodes in your chart. Each meditation is personally delivered in the grounded and soothing voice of Marina Ormes. 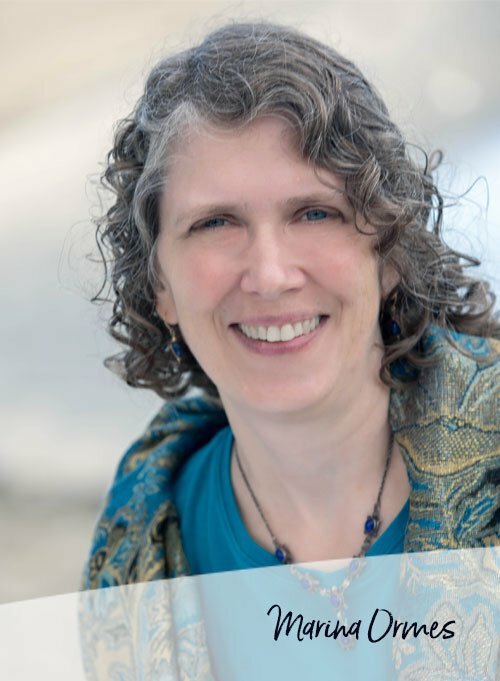 Marina has been developing her unique approach to guided visualization and energy healing for over 20 years. The carefully chosen imagery supports you on conscious and unconscious levels to heal and awaken creative parts of yourself, and open you to receiving what you want and need. Each meditation aligns you with the energies of the cosmos. Marina works with the unique astrological energies of each New and Full Moon to create a meditation that awakens the highest possibilities for healing and growth not just for the Moon sign, but for the whole chart of each New and Full Moon. NO experience with astrology or meditation is required. You are not expected to “believe” in astrology or visualization. During the meditation, you are invited to simply relax and open to the healing experience. JOIN AS A LUNAR EXPEDITION MEMBER NOW! The first month you are enrolled, and once every three months thereafter as long as you remain enrolled, you will receive a VALUABLE TRAINING VIDEO from Marina’s popular Cycles for Healers program. The second month you are enrolled, and once every three months thereafter as long as you remain enrolled, you will be invited to a live, virtual group ASTROLOGY INTENSIVE with Marina. Recording provided. The third month you are enrolled, and once every three months thereafter as long as you remain enrolled, you will receive a PRIVATE one-hour SOUL PURPOSE COACHING session with Marina, by phone or web. The Moon shows us how to create in a natural rhythm of waxing of waning – or expression and activity balanced by receiving and integration. Our Lunar Expedition and Solar System Voyage levels provide deep support in a fun, nurturing structure that helps you optimize these natural energies of change and stand strong in what is most important. Join us now and you will receive all of these premium benefits for the special offer rate. (No obligation – cancel any time.) This low monthly rate is LOCKED IN for the life of your subscription. In other words, as long as you remain current, your monthly rate will not increase. Marina translates the messages from the cosmos so you stay current with what is happening, why, and what you can do about it. With three different membership levels to choose from, you can get exactly the support you need to align consciously with natural cycles of energy for continued healing and change. Upgrade today to receive deeper support that keeps you on track with your personal goals and intentions. Here is a detailed description of everything that is included. The 2017 Solar Eclipse was an important moment that will remain potent years into the future. Listening to this meditation will help you step into your calling as an agent of healing and compassion in the universe. It will help you access clarity and align with your deepest truth while knowing you are deeply supported and nourished. 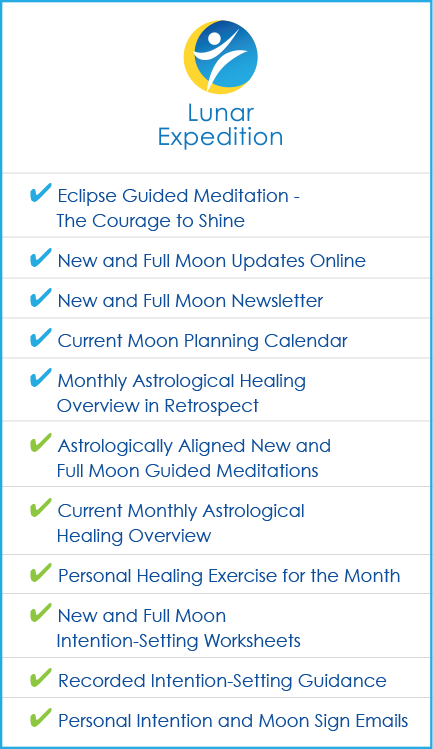 Marina’s New and Full Moon email updates are loved and followed by thousands of healers and visionaries around the world. Get quick, digestible insight into what is happening energetically around each New and Full Moon, and how to best align with the available energies. Access Marina’s New and Full Moon updates online via your membership portal in addition to receiving them via email. Includes archives of previous updates so you can easily refer back. A user friendly guide to the “mood of the day,” the Astrology Heals Moon Planning Calendar will help you immediately know how to focus each day for optimal healing and results, the best times for things like action, brainstorming, and self-care, and what will make your loved ones, clients, colleagues, and potential customers feel heard and served on any given day. Last month’s astrological overview will give you an idea of what was happening last month to help you put it in perspective. You will know the deeper meaning behind what was shifting and what it reveals about our ongoing collective healing and transformation. Marina records a brand new guided meditation for each New and Full Moon that is aligned with current astrological energies. These 30-minute guided meditations change your reality immediately–bringing deep relaxation, refreshing clarity, and inspired creativity. They help you access your own inner wisdom, natural healing abilities, and courage to be a force for positive change. This current astrological overview will give you a heads up for what to expect for the coming month so you can be ahead of the game. You will know the deeper meaning behind what is happening and what it reveals about our collective opportunities for healing and transformation. Includes guidance on where to focus based upon the element of your own personal Lunar Nodes. The healing exercise is relevant and aligned with current astrological energies. It may include questions for reflection and journaling, ideas to help you shift patterns, or areas to focus on that work with natural cycles. Each exercise is easy to integrate into your daily life or regular self-care practices and can be adapted to work with your personal needs. These worksheets will help you work consciously with Moon Cycles to do the inner work that will help you manifest your desires. They will help you focus on what is important to you personally and to effortlessly align with the unfolding energies to live into your deepest hopes and dreams. Each New Moon brings a unique part of the whole picture of healing and transformation. From Aries through Pisces, these brief recordings will walk you through the specific healing opportunities of each unique New Moon sign, and help you set clear intentions so you are deeply supported. The Moon changes signs every 2-2.5 days. Each time the “mood of the day” will shift in a way that generates a specific background feeling and needs. You will receive an email every time the Moon enters a new sign that reminds you of your personal intentions, tells you what to expect, and gives you insight into how to be most aware and aligned. You receive a new video from Marina’s paradigm-shifting program Cycles for Healers every three months. Each training video reveals simple and profound tools from astrology that can move your holistic healing practice or visionary service-oriented business into expanded paradigms of possibility. These tools help you understand what your clients are craving and searching for so you can connect deeply, see them for who they truly are, and meet their deepest evolutionary needs. In this exclusive opportunity, once every three months you will be invited to attend a live, interactive, virtual group intensive with Marina. Each intensive will be on a specific topic and will include how the material covered affects you personally. Topics will be announced but may for example include Saturn Return and stepping into your authority, Pluto and the path from victimhood to empowerment, or Mars and your best way to take action. Every three months you will have the opportunity to work privately with Marina. You will discover why your life story and personal challenges are the way they are and what to do about them. Insights from your own chart guide you and enhance but do not replace your own inner wisdom. Together with Marina you will create and implement a soul-based action plan that gets you from where you are to where your soul craves to be so you can fully live your life purpose. No long term commitment. Cancel at any time. Manifesting with Moon Cycles and Marina’s Meditations. I am consistently astounded by the quality Marina produced. Her meditations never fail to bring me into the clarity and alignment I need in order to take decisive action. Because of your meditations I feel more steady than ever and that steadiness is allowing productivity in a way I’ve never experienced. It is bringing me more joy than I’ve ever imagined. Click to listen to Shena Salvato’s inspiring story about listening to a Manifesting with Moon Cycles meditation. Marina’s work brings a blanket of support to those of us who are working to heal ourselves and the planet. The meditations help me see the big picture and not take things personally. Click to listen to Lev Natan’s sharing about Marina Ormes and the Manifesting with Moon Cycles Lunar Expedition level. Click here to listen to an interview with Deonne Wright about the magic and mystery of the Ruby Crystal Alchemy sound healing in the background of the meditations. Click here to read Marina's personal story about the magic and mystery of the native Zimbabwean music at the beginning and end of the meditations. Click here to read Moon Cycles and Manifestation: Guest Blog Post by Michelle Peticolas Ph.D.
Manifesting with Moon Cycles is created and provided by Marina Ormes. Marina is an Evolutionary Astrologer and retired Holistic Nurse with over 20 years background in astrology and holistic healing. She is the founder of Astrology Heals and the creator of Manifesting With Moon Cycles. She is the author of Cycles of Healing: Personal Transformation In Relationship To a Living Cosmos. Her work has impacted thousands of visionaries and healers around the world. Awaken your heart's truth. Manifest your soul's passions. Supported by the rhythm of natural cycles.